The Starmark Everlasting Bento Ball is a durable rubber chew toy designed to hold one of Starmark's Everlasting Treats. The bottom of the toy also has a place to hide kibble and other small goodies. It comes in three sizes for small, medium, and large dogs. We have a medium Bento Ball. I was a little hesitant to buy it because Brisbane destroyed the Everlasting Fire Plug in minutes and he really isn't a destructive chewer. That was quite a few years ago though, it was the only Starmark toy to fail us, and the company has had years to improve their product. The ball itself holds an edible Everlasting Treat. These are hard, digestible chews that come in three sizes and can be enjoyed on their own or in various Starmark toys that make them harder to devour. For whatever reason, my dogs often find these to be hit and miss, sometimes they can't wait to snarf it down and other times they ignore it for months. They definitely prefer the liver and vanilla flavored treats over the chicken ones. Naturally, most local stores only carry chicken. It can also be used with the Everlocking Treats, which feature a threaded rod and two nuts that screw down onto it, all made out of the same stuff as the Everlasting Treats. So far the Bento Ball seems to be more successful than the original Everlasting Treat Ball. Brisbane and Uly will both spend a good long time getting treats out of it, and Ru particularly enjoys gnawing on the Everlasting Treat. I often find the Bento Ball in Ru's bed with his Nylabones. I'm a bit worried about its longevity though, the lip around the edge is already developing some splits. It's not in danger of being destroyed like the Fire Plug, and the boys aren't going to be gnawing chunks off and swallowing them anytime soon. Pros: Fun toy for hiding food, holds gnawable long-lasting edible chew. Dishwasher safe. Durable flexible material smells pleasant. An entertaining puzzle toy for dogs that are new to the concept, or don't want to put in a lot of effort. Cons: Mine is splitting around the edges. 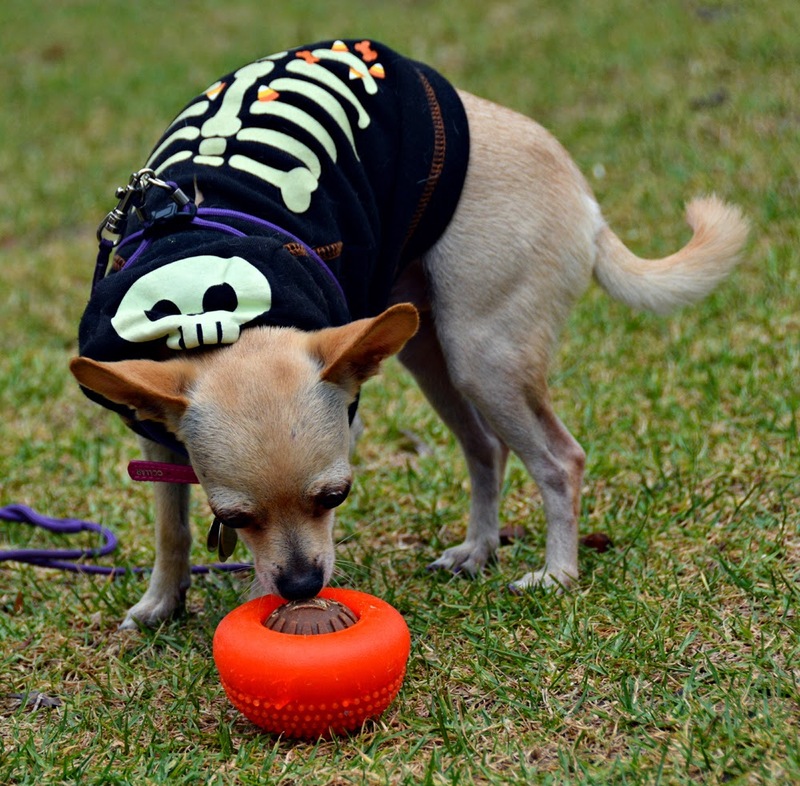 The treat chew can be difficult to pop into the toy unless it or the ball is slightly wetted first. Bottom Line: This toy gets a lot of use around here, the dogs seem to like it better than the original Everlasting Treat Ball. They don't always gnaw the treat out right away though, maybe it isn't tasty enough?